In the summer of 2007, Johannesburg-based photojournalists Chris Marais and Julienne du Toit moved to Cradock in the Eastern Cape Karoo Heartland and began the adventure of their lives. They travelled the vast Karoo in their dusty bakkie, painstakingly recording the lives and stories of the people who call this area home. On the way, they picked up a wealth of lifestyle, historical, cultural and natural information. 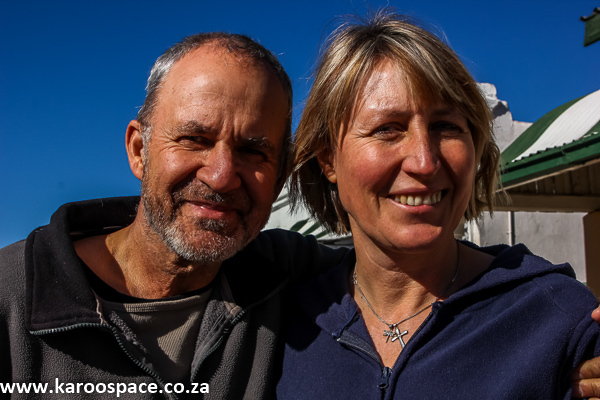 Chris and Julie established Karoo Space, which quickly became the Karoo website of reference. Over the years, they have built a network of friends, contacts and sources in more than 100 towns and villages around South Africa. They freelanced for a number of South African and international magazines, selling mainly Karoo-based editorial. They are regular contributors to the popular SA Country Life magazine. The year 2009 saw the launch of what became the best-selling Karoo Keepsakes, a colourful and beloved print record of their encounters. 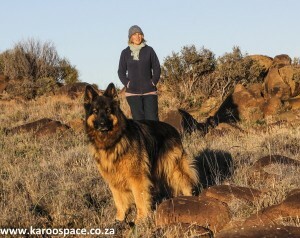 Julie and TwoPack, the family dog. 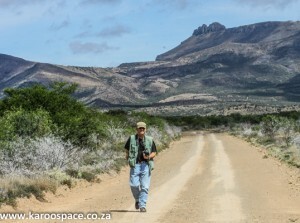 As contracted photo-journalists for the South African Tourism website – http://www.southafrica.net – between 2010 and 2013 they provided mostly Karoo material and, indeed, put the region on the SA tourism grid. Karoo Keepsakes II followed in 2013. Both books have gone through several print cycles and are still in circulation, due to reader demand. Sometime in 2011 they entered the anti-fracking (shale gas exploitation of the Karoo and a dire threat to its groundwater) fray and covered many of the small-town meetings between local communities and various Oil & Gas companies, big and small. Most times, Jules and Chris were often the only media representatives present. 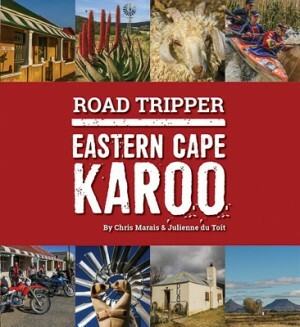 In 2016 they published Road Tripper – Eastern Cape Karoo, a new-era travel guide to their home district. Their latest (and most ambitious) publishing venture is a warts-and-all account of rural living called Moving to the Platteland – Life in Small Town South Africa. Chris taking a walk on the Plains of Camdeboo. “It’s all about swopping the urban rush for a fuller life with wide open spaces and more hours in the day,” they say. The book contains the experiences, advice and general lifestyle accounts of more than 200 downsizers Chris and Julie met and interviewed during their time on the road in the platteland of South Africa. “Join us in the countryside. Make a big difference in a small town. Lace on those walking shoes, step outside and exhale. Find your creative self,” they say. Moving to the Platteland will be launched in July 2018. Watch this space.